I suppose it is prudent to begin in the middle, at least as far as my trip is concerned, with my one-day drive to Schleiz and Saalfeld. When I began traveling to Europe a lot of years ago my photographic weapon of choice was an old warhorse of a Konica 35mm SLR. Built to last and weighing nearly enough to deny it modern carry-on status, its film had to be changed dexterously and in the dark. I can recall having to do it more than once with my hands inside an empty duffle bag. One never knew if a particular photograph had turned out until developed weeks later — remember Fotomat? — and, more than anything else, the cost of film and developing set a hard limit on the number of pictures one was prepared to take. Things are different now. 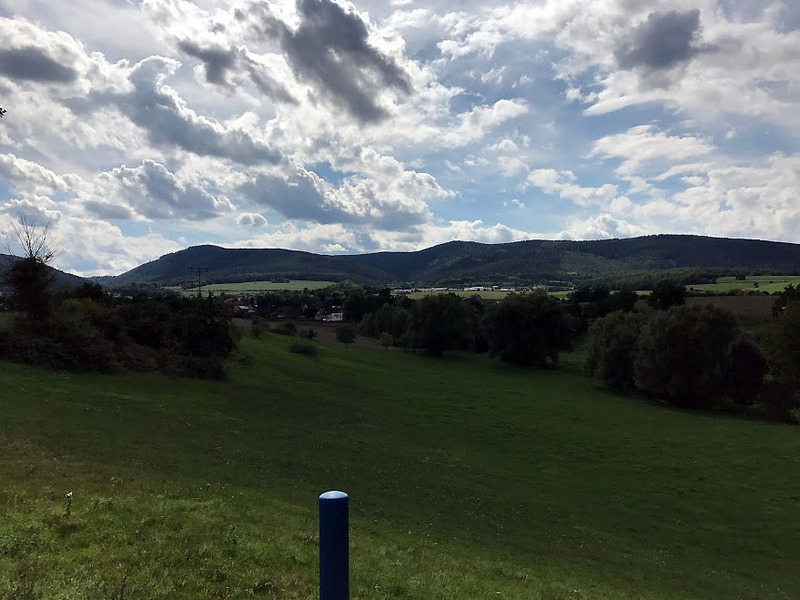 I’ve spent the weeks since returning from my journey to Germany going over the thousands – yes thousands – of photographs I took of Jena-Auerstedt and other battlefields on my iPhone trying to figure out which ones tell this story best; or, honestly, even how to begin telling it. I suppose it is prudent to begin in the middle, at least as far as my trip is concerned, with my one-day drive to Schleiz and Saalfeld. The former, it will be recalled, was more of an action than a battle and took place on October 9, 1806. Marshal Bernadotte’s I Corps had been probing North as the Emperor’s battalion carre debouched from the Thuringian passes, tasked with finding and fixing the Prussians. 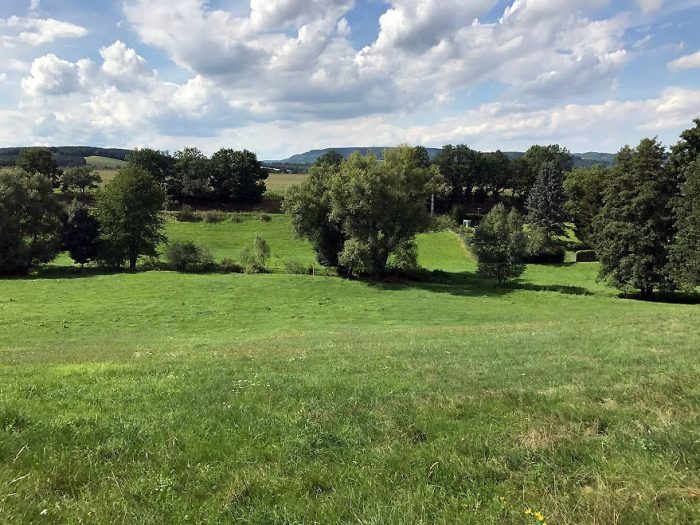 His advanced troops, found the left flank of the Prussian army near the small town of Schleiz. Their troops engaged throughout the afternoon in the space between Schleiz and the village of Oettersdorf to the North, but the Prussian commander Tauentzien realized the size of the French force approaching and began an orderly withdrawal. 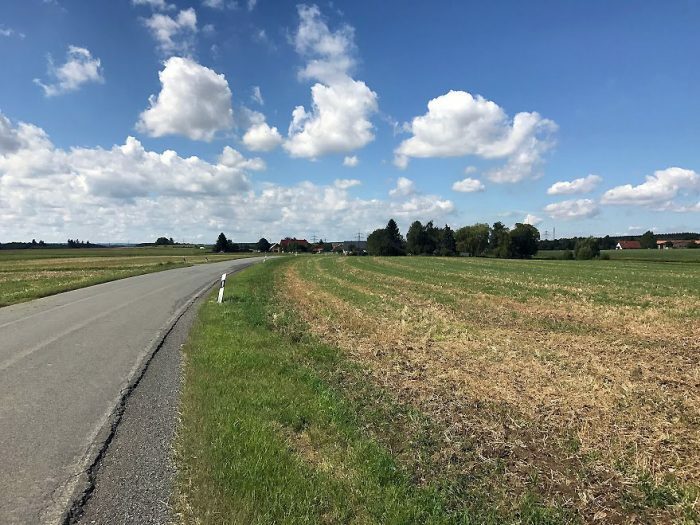 Unfortunately, he had sent a small detachment to guard his right flank near the village of Crispendorf, a few kilometers West of Schleiz. 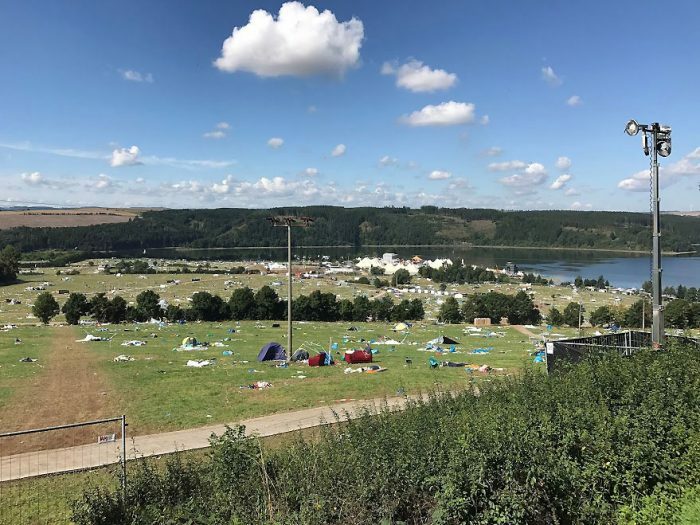 When Tauentzien began his retreat this detachment began making its way North and East and wound up in the woods near the village of Pormitz just North of Oettersdorf. 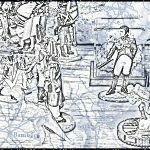 There, this detachment, under a commander named Hobe, got caught between one of Bernadotte’s advancing infantry battalions and the ever-sweeping cavalry of Marshal Murat. They were badly mauled there and accounted for the majority of the casualties from this battle. Note Pormitz up at the top. 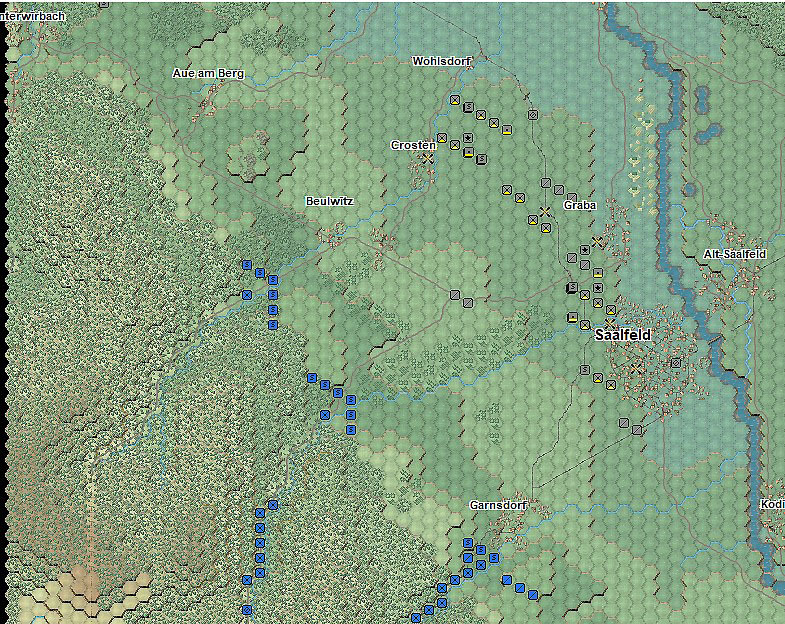 Schleiz has grown a great deal since 1806 and in the process much of the battlefield has been lost as it’s reached North and Oettersdorf has reach South. 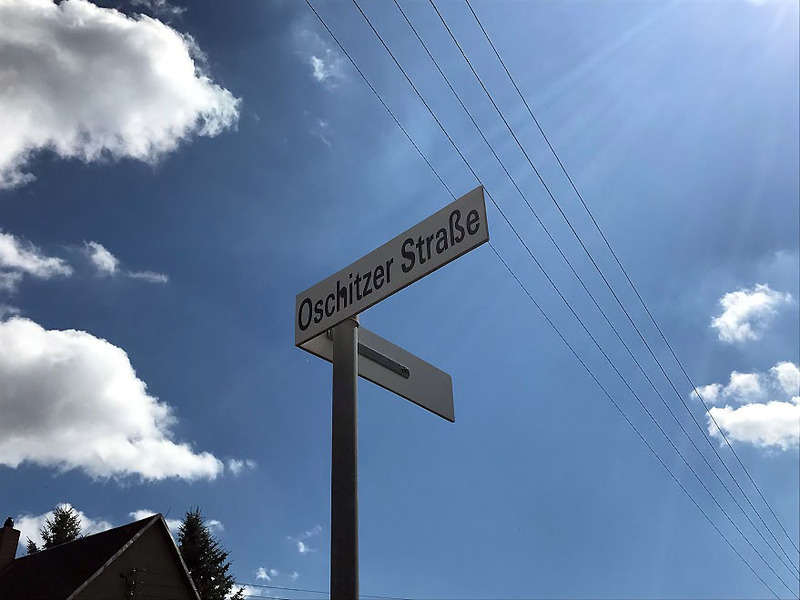 Notable among the losses, the village of Oschitz, which I desired to visit for reasons I should probably be ashamed of, has since been absorbed by greater Schleiz and is commemorated largely by Oschitzer Strasse that still runs through it. 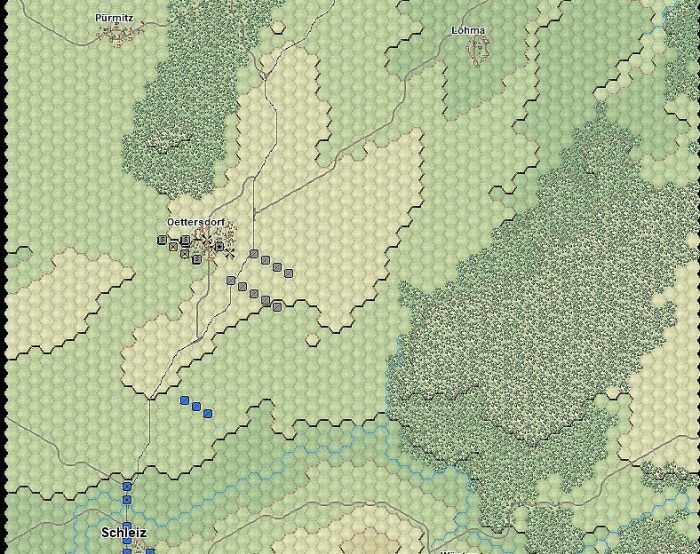 Despite this, I wanted to follow as much of Bernadotte’s approach road as time allowed and that lead to the Saalburg-Ebersdorf area which, if you refer to the above hex map, is off screen to the South and West by a small distance. I arrived on a Monday and, as it turned out, this was the Monday after the SonneMondSterne dance festival had wrapped up. I knew something had to be up even before we got to the battlefield when I discovered that the parking lot of the MacDonald’s where we stopped briefly nearer to town was filled with an eclectic range of vehicles, largely the product of the unmourned G.D.R. These vehicles were, in turn, inhabited by bleary-eyed young people blasting EDM from their stereos. I could say more about the peace it brought me to realize that bros are bros no matter what language they speak, but that, I think, is a separate conversation. I have little notion of what takes place at an EDM event — the middle-aged mind entertains all matters of bacchanalia — but these folks do seem to leave a mess. View from the approach road. Turning toward the village, while the trees are certainly not in the configuration that would have confronted Bernadotte, the forest that he first ordered his men to clear of the enemy would have looked a fair bit like this. 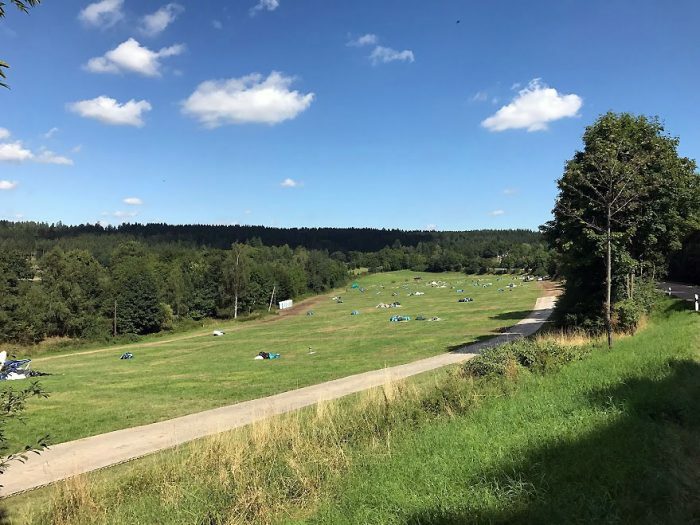 Woods are for real in Germany. North of Oettersdorf, one does better. Houses and a few businesses give way to rolling farm fields. 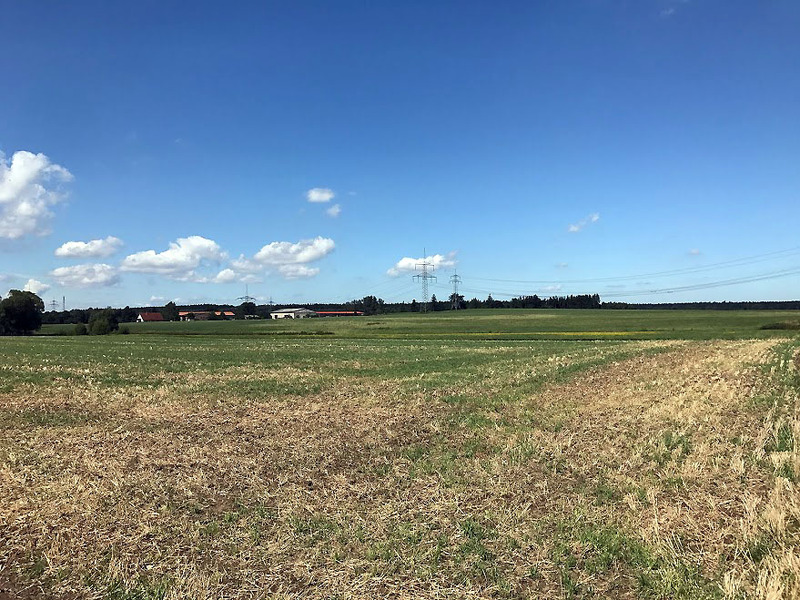 Here, in the fields near Pormitz, you can see the general area where the forest once stood and Hobe’s men had such a bad time. Hell in a fairly small place. More hell in a fairly small place. It was on our way from Schleiz to Saalfeld that my wife first made the observation that she would repeat many times over the course of our battlefield visits: the terrain in Thuringia would have been just ghastly for any army not following roads. 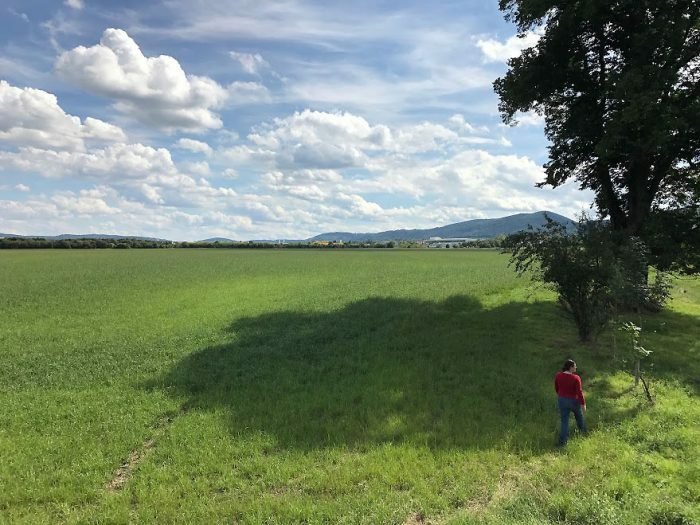 And it is not just the southern boundary mountains between Bavaria and Thuringia. 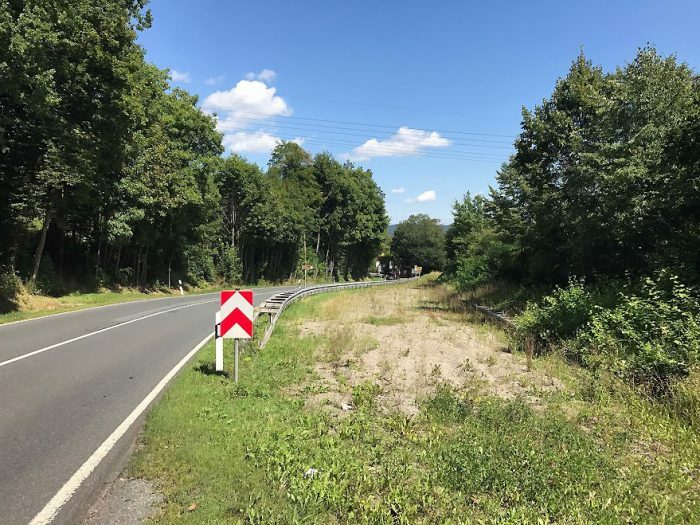 The entire region is a series of high hills or mountains intersected by long, green valleys and it is through these latter features that most of the roads run. We often saw dramatic views from the Autobahn of these roads running in the shadow of imposing hills and, thinking of the “Flight of the Eagle” Kriegsspiel that continues to run in the grogheads.com forums, she was given to offer only two words for armies so unwise as to try and move overland: “movement penalty”. Sure, it’s a view from the Wartburg, but you get the point. Saalfeld, fought one day after Schleiz, was the first real battle of the Campaign of the Fourth Coalition and, certainly given the effect it would have on Prussian morale, a significant cause of Prussia’s ultimate defeat. Prince Louis Ferdinand had been one of the most vocal members of the war party in the Prussian government. 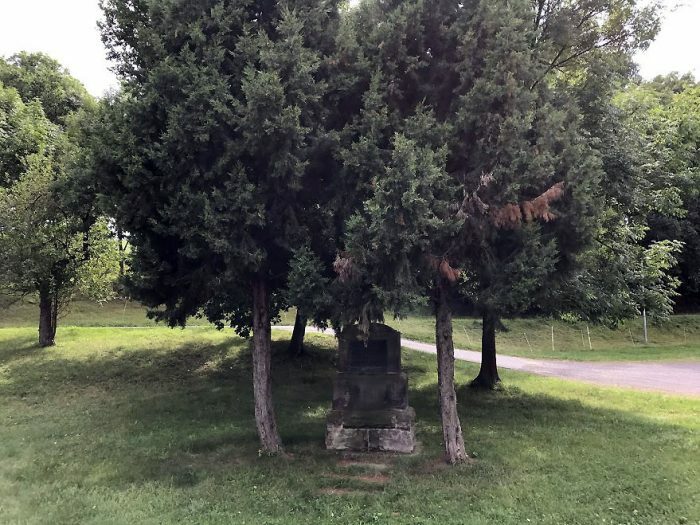 A good commander of unquestionable bravery, he found himself in the unfortunate position of greeting Marshal Lannes’ V Corps as it debouched from the Thuringian Alps near the village of Garnsdorf. Not realizing that the army approaching him outnumbered his own, he decided to stand. Worse, he put both Saalfeld and the Saale River to his back and, for reasons lost to history, left his right flank in space. Lannes, who one suspects could hardly believe his luck, briefly bombarded the prince but then attacked the exposed flank. Fairly good example of “don’t do this”. Pressed hard up against Saalfeld itself, Louis Ferdinand gathered his cavalry and personally lead a charge that attempted to prevent the collapse of his army. The charge failed and Louis Ferdinand was killed by the quartermaster of the 10th Hussars who, it should be noted, first offered him a chance to surrender. With him died one of the better chances the Prussians might have hand for reversing their fortunes in this campaign. Saalfeld has grown even more than Schleiz and, driving down the road from Garnsdorf, I will admit I was prepared for disappointment. Lined by businesses and homes, the road down onto the Saalfeld plain is not inspiring. One does not get chills. The northern end of the battlefield, however, is fairly spectacular. First, most of the geography is still in place. As the map above shows, there was a glacis marking the end of the Saalfeld plain as it rolled down from Saalfeld to Wohlsdorf and, eventually, the Saale. 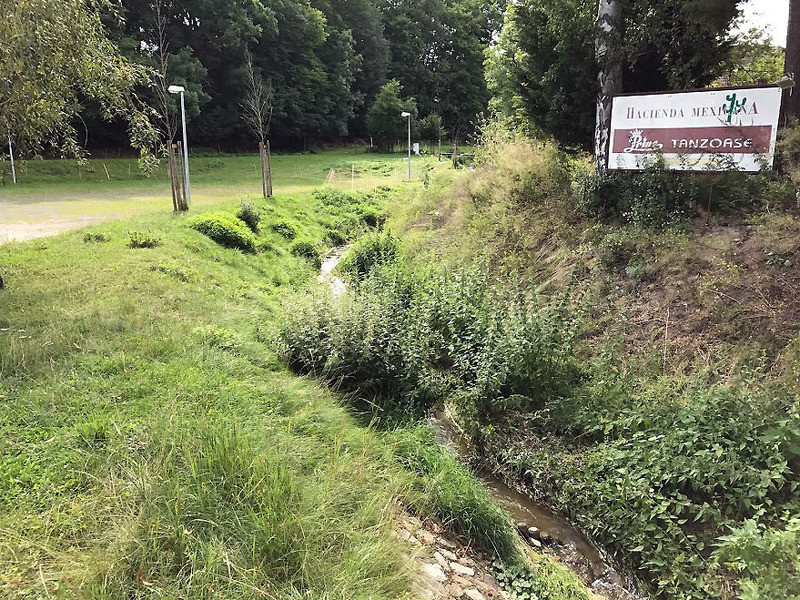 That plain and the small stream that ran through it in 1806 are still there. I love finding things like this. The village of Crosten, slightly grown, is in the foreground. It feels just like October 1806. Even more inspiring, though, is the view from the edge of the glacis back to the hills from which Lannes descended. It does not take much to imagine what the look of his columns coming down the three passes would have been. The spot where Louis Ferdinand fell, not far from the edge of the glacis, is marked by one of the ugliest monuments I have ever seen. He, frankly, deserves much better. O.K., maybe the trees are nice? The glacis ends just up the hill behind this monument. Before wrapping up this chapter of the story, I wanted to let you all know that I did complete my pilgrimage. As I wrote earlier, when I discovered that Baron von Reisswitz’s original Kriegsspiel table was on display in the Charlottenburg Palace, there was little that might have been done to keep me from it. I flew into Berlin from the United States and spent my first day combining shoe leather and mass transit in a journey to the castle’s “New Wing”. 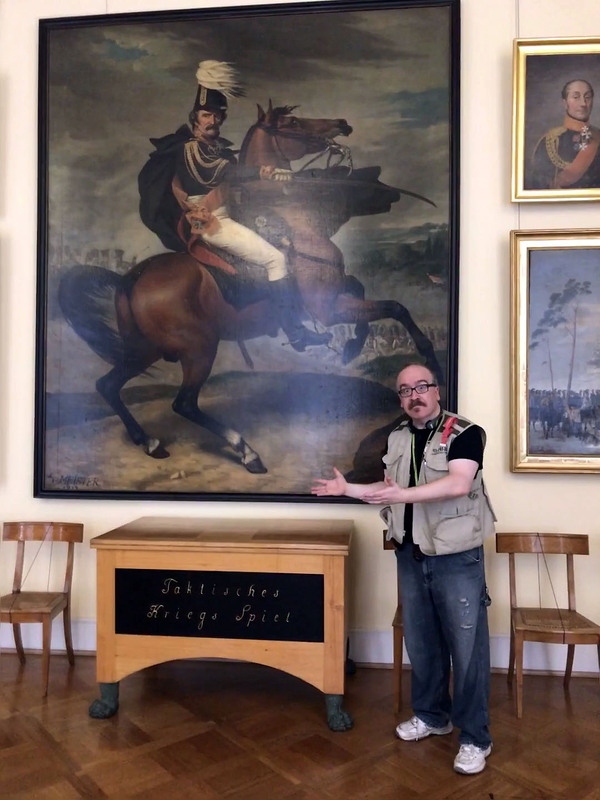 There, beneath a painting of Blucher, sat the nondescript bit of furniture that, to those of us that understand, represents the beginning of all wargaming. It very nearly made the entire trip worthwhile. 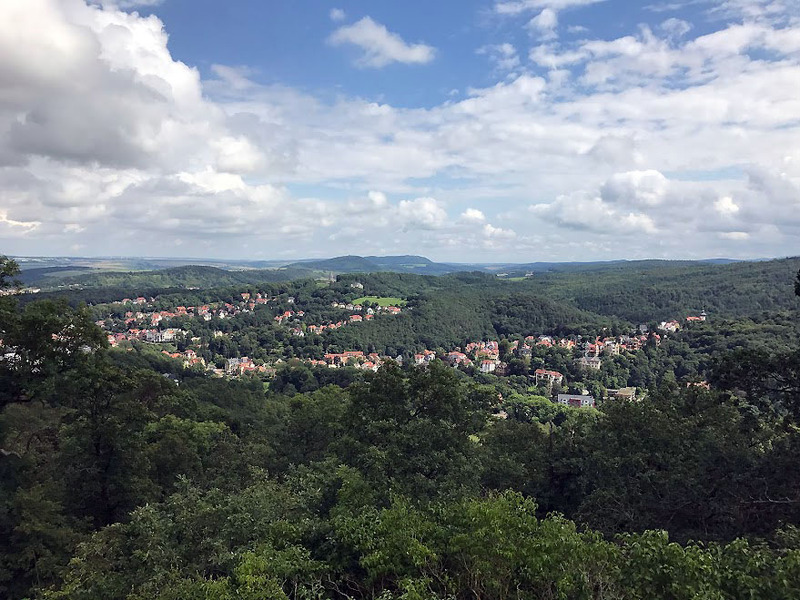 When next we visit — Jena, or your author climbs a ridiculous number of hills.